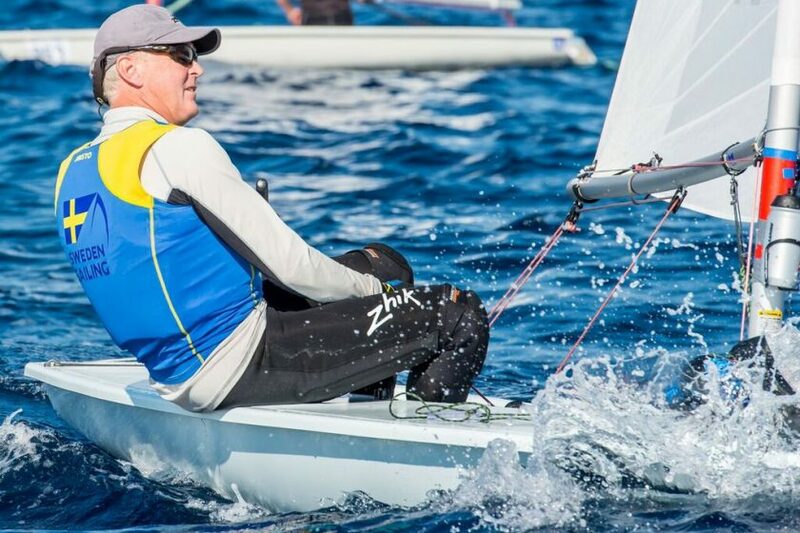 (Split, Croatia) – After two days of delay, waiting for wind and shopping for the best forecast app, racing finally got underway at the Laser Masters World Championships in Split. Long standing battles continue and newcomers seek to take over past heroes. The 350-strong fleet, divided evenly between the Laser Standard and Laser Radial, went afloat mid-morning on the tail end of a northerly Bora wind. The sailors patiently waited for the forecasted 6 to 7 knot south westerly wind to arrive at 14:00. Both fleets sailed on different courses and were further divided into groups of 10 years, starting from 35 years +10 through to 75 years +. These sailors are affectionately known as the “Legends,” sailing only in the Laser Radial Great Grand Masters (65+) fleet. The Laser Radial Great Grand Masters fleet exemplified sailing as a “Sport for Life” today. Among the 62 sailors in this fleet are 17 “Legends,” including Deidre Webster from Canada. In the front end of the fleet, Legend Kerry Waraker from Australia is sitting in second, behind fellow countryman Rob Lowndes.